To upgrade your factory radio is a great way for you to enjoy more up-to-date features which can meet your different needs in your car while you are driving. For example, the GPS navigation system can provide you with the most accurate guidance for you to get to your desired destination within the least time. It’s not too difficult for you to install such a multifunctional unit in your car. For your reference, here’s a detailed installation guide about a Seicane 2004-2012 Mercedes-Benz SLK R171 head unit. If you have the same dashboard, you can follow it for the installation. Open the little box beneath the radio and remove the screws with a screwdriver. Pry the trim panel on the right side of the box with a removal tool, after that, remove it. Remove the screw with a screwdriver. Pry the leather surrounding the brake, then pull it up, at last, remove it. Remove the trim panel under the brake with your hands. Disconnect the connectors behind the trim. Take the box out of the dashboard. Disconnect the connectors behind the box. Remove the trim panel on the box with your hands. Disconnect the connectors at the back of the trim panel. Remove two screwdrivers inside the trim panel. Take another box under the radio with your hands. Disconnect all the connectors at the back of the box. Remove two screws after taking away the box with a screwdriver. Pop out the disc player. Remove the screws at both sides of the disc player. Take the disc player out of the dashboard. Remove two screws holding the radio with a screwdriver. Take the radio out of the dashboard. Disconnect all the connectors at the back of the radio. Connect the connectors and cables to the new Seicane head unit as the user manual shows. Put the new Seicane head unit into the dashboard and turn it on to have a comprehensive check. If everything works well, then install all the screws, boxes and trim panels accordingly into their original places. If not, check carefully whether all the cables are connected or not. That’s the step-by-step installation guide for a 2004-2012 Mercedes-Benz SLK R171 head unit. If you have any questions, you can turn to your dealer or a professional for help. Please make sure you are clear about every step before you start to install. If you think it too hard for you, you’d better have it installed by professionals. What makes this Mercedes-Benz SLK R171 head unit so popular with most car owners is that it can support an optic fiber decoder which can keep your factory car’s optic fiber and all the speakers still working after installing this unit. And the sound quality is quite high. It’s easy to install this decoder as well. This unit comes with a large 7 inch multi-touch screen for you to simplify the operation. The latest GPS navigation system makes it easier for you to find the best way to your destination. Besides, the Bluetooth connectivity enables you to wirelessly pair with your compatible devices to stream audio and accept and receive phone calls through the integrated microphone. 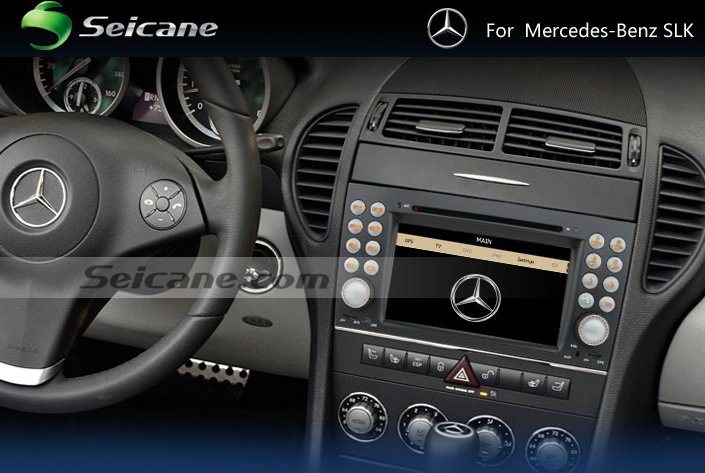 Getting to your desired destination, this hot selling Seicane Mercedes-Benz SLK R171 head unit is just your best choice. Just take it and go right now!